The holidays are here, which calls for dressing up more than any other time of the year. 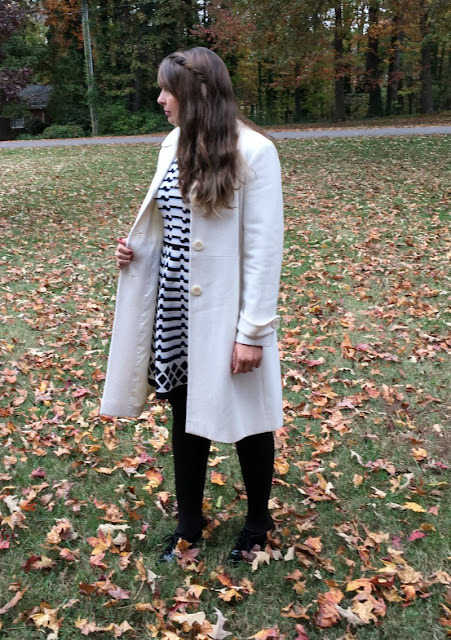 I am making a bold statement by pairing winter white and black together in a geometric print dress and wool coat. I recently won a giveaway for Eliza J dress and I picked this one, since I do not have a lot of long sleeved dresses that are appropriate for Winter. I love the fit and flare style of this dress, which I think is flattering on pretty much every body type. 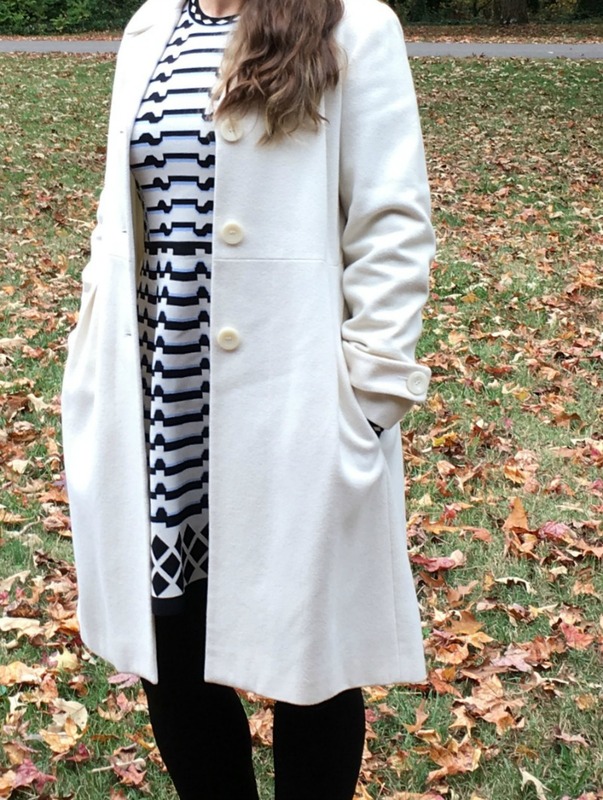 I paired it with black tights and black patent leather oxford heels, topping it off with a winter white 3/4 length wool coat. Since the geometric pattern is busy, I kept the jewelry simple with a pair of large teardrop druzy earrings. This look would be perfect for a semi-dressy Christmas Party or wedding. That dress is so fun! I love the print of it and your hair looks gorgeous this way! This is one of my favorite dresses on you! Cute! Thanks! It fits so well! I need that dress in my closet. Anything black and white is so me. Plus I'm a sucker for stripes. You look gorgeous! I love finding cute dresses to wear with leggings! The pattern is really pretty on you! You are so pretty in this dress, Mary! I love the print and b/w always looks elegant. I need some more long sleeves dresses, it has gotten so cold here! Oh thank you so much! 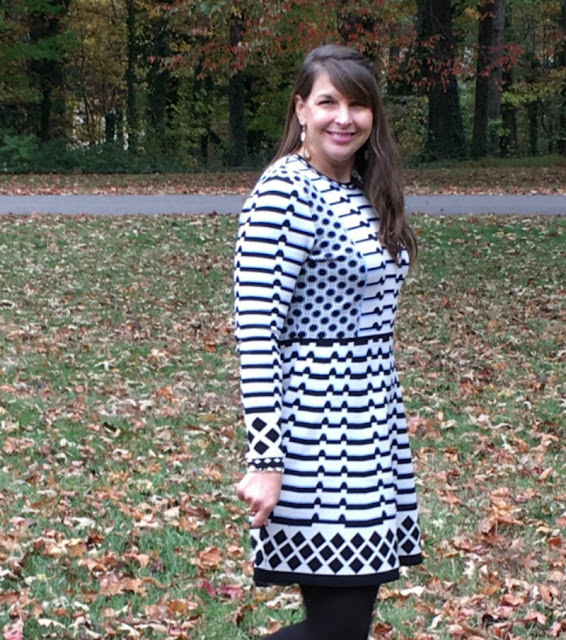 I only have a few long sleeved dresses too! This dress looks so good on you! The print of this dress is amazing, I would definitely love to get one. Thank you! The print is fun! Oh what a beautiful dress! So lucky you won it! Fit and flare dresses are my favourite, I agree they are such a classic that always looks good. THank you, this style of dress is definitely flattering!